Notre Dame Coach Kelly slated his players at practice on Wednesday as they broke up for Easter break with some stinging words from their new leader. “We stink right now,” said Kelly bluntly. Kelly was hired to turn the fortunes of the team around, and he is demanding that that sea change starts now. “We don’t have time. We got to do it now,” he continued. “It’s got to get done the right way. You get 15 practices, and that’s all you got. However, it was not all doom and gloom as Coach Kelly was given a glimmer of hope by the work from his defense. Not the best progress report to come out of South Bend, but better right the ship now before another season of football comes and goes for the Irish. Wide receiver Michael Floyd admitted that payers were not in the zone for their coach. “He (Kelly) pointed out that we are not focused,” he said. 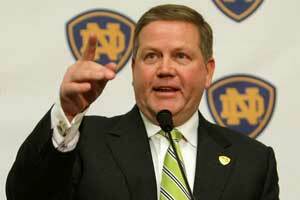 Better dust off the cobwebs before Coach Kelly does a bit of spring-cleaning of his own.